And now for something completely different! 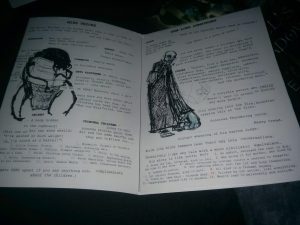 This little ‘zine can, per the writing of this review, only be purchased in print and, at first glance, seems to be 7 pages long – however, this supplement can be unfolded into a massive poster that is littered with the maps of the place featured, with adventure hooks, and stats – The stats note AC (ascending), HP, attacks + damage and brief special features like “climbs easily.” Skills are noted as “X in 6.” Thus, as far as rules are concerned, this pretty much can be considered to be easy to implement in most games. No level-range is provided, though I’d situate this somewhere along the level 5-7 range in most games. Apart from the cover, every little space available herein (beyond the cover) is crammed with information. But what is this? It is, essentially, a location with curious NPCs (all illustrated in Scrap Princess’ unique style) that you insert PCs into. The adventuring will happen organically, but you should not expect a pre-fabricated adventure, as much of how this turns out is contingent on how you and your players interact with and present the characters. Genre-wise, I’d consider this to be, in essence, a macabre and somewhat hilarious dark comedy of manners – something you only rarely get to see in RPGs. This was moved up in my reviewing queue do to a patreon supporter who requested that I cover this one. I am going to THOROUGHLY SPOIL this in the following discussion, so potential players should definitely jump ahead to the conclusion. All right, only GMs around? 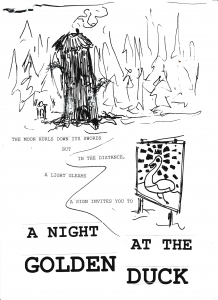 Well, the Golden Duck is basically an Inn unlike any your adventurers have visited. The place is run by Miss Tricks (lol), a bug-creature. A really friendly bug creature with the personality of a granny. Miss Tricks gets flustered easily and to calm her down, one has to stroke her head and say “Now now Miss Tricks, now now.” She also likes telling tales of criminal children, who inevitably end up in jail – and not showing sympathy may result in here becoming upset. Oh, and she has a corpse in the closet. Only, it’s not a corpse – it’s one of her own shed shells. The guests include Arm-Long Armstrong, a thief taker who REALLY doesn’t want to take in thieves. Why? Because his one arm grows longer when thieves are caught. The other one is crippled and small – it would grow if innocents are set free. He also has a penchant for one-upping any stories with more nihilistic equivalents, and several such tweaks are included. Chaffinch the thief seems to be a nice fellow – they are honey-tongued and sympathetic, and a kleptomaniac, but state so in advance. Unfortunately, the discovery of major treasure can trigger a fugue-state breakdown of most violent proportions. Doctor Roaaak is a superb doctor, but a super-crappy psychologist – unfortunately, he does insist on poking folks, proverbially and metaphysically, when treating them. He also carries a suspicious fiddle around, is paranoid…and, alas, does have a secret that can be rather malignant. Oh, and he’s basically a massive raven in a doublet. And then, there’d be “Pierre Pierre Pierre” – who looks like an ape, has a strong French accent and does NOT speak French. He’s also a loyalist and tries to recruit the PCs into counter-revolutionary forces. So, the NPCs alone are hilarious and brilliant – but to help you make this work as a module, we also get a chronology of suggested events. During the serving of dinner, the GM can paraphrase or just read the most direct hook – The Golden Duck, which is presented as part of a legend concerning the marriage of the princess of birds and Boreas. Oh, and guess what? The fabulous duck is supposed to still be here. It is. It can actually be found by clever players, courtesy of…a pun. A perfect resolution here! The wealth of angles and how PC interaction with them will ultimately trigger how they behave is brilliant. This could end in anything from a memorable and wonky evening to a true massacre. Editing and formatting re hard to judge due to the collage-style and the puntastic nature and presentation. I was not taken out of this supplement while reading it. Layout is interesting and very artistic, evoking, as noted, a sense of looking at collages. The fold-up angle is cool, though I do worry slightly that it will, in the long run, hurt the longevity of the supplement slightly. And longevity and replay value this indeed does have galore, courtesy of the unique and amazing NPCs. The humor is dark and absolutely fantastic as well. If you like Scrap Princess’ style, then you’ll love this on an aesthetic level. (Personally, I very much enjoy the collage-style look!) Patrick Stuart delivers an amazing, fun and truly enjoyable ‘zine here – I hope that it’ll be the first of many. My final verdict will clock in at 5 stars + seal of approval. 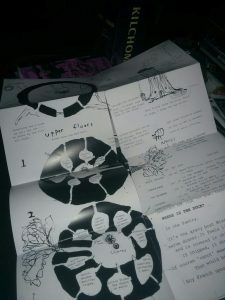 You can buy this cool ‘zine exclusively here!